This won’t be new information for many of you, but now that the new forums are up, I thought the launching of Diversity 2.0, so to speak, would be a good opportunity to sum up the conversation thus far, in particular all of the great statistical work done on the temp boards. The foundation of this essay, and the ensuing discussion, is the belief that the Star Wars Expanded Universe has a responsibility to present a diverse galaxy of characters, and that with some notable exceptions, this responsibility has been largely neglected. There are too many white human men. While passionate and fair arguments can be made for any number of specific “minority” groups being given a larger role–aliens, people of color, women, LGBTQ, the disabled, and so on–the one thing everyone should be able to agree on is that more white human men (hereafter referred to as WHMs), of standard body type and orientation in particular, are helpful to no one, and only by making their long-held “default” status painfully obvious can anyone else hope for a fair shake. Ignorance is bias. Which is to say, when presented with a divisive issue, choosing to disregard it still constitutes taking a stand. To ignore race and orientation is itself a biased act, not a neutral one. The images above are of the Jedi Council from Episode I and the leadership of the New Jedi Order as of the early Legacy Era. It is my position that no clearer evidence of a problem exists than in these two images, wherein the WHM ratio is essentially inverted. Lastly, it should be understood that this situation stems from the accumulation of numerous decisions, policies, and cultural trends–over a period of decades–and cannnot be laid at the feet of any specific author, editor, or even publisher. The primary goal of this manifesto is for you, the reader, to look at those two images and see a problem. The goal of this as a discussion thread, then, is to break down the can of worms that follows from that. In order to understand how we got to this point, one of the most important things to consider is the distinction between primary characters–not just the ones most heavily featured, but those whose points of view are typically given in the text, and who in some cases are even meant to be stand-ins for the reader’s own point of view–and secondary characters. Even among some of the most diverse works in the EU, you would be hard-pressed to find a cast without a WHM in the top spot – Cade Skywalker in Legacy, Jax Pavan in Coruscant Nights, Dass Jennir in Dark Times. Those series are absolutely better than the alternative, and should be seen more as detracting from the problem than contributing to it, but it’s this phenomenon that’s responsible more than anything else for the unfortunate state of the post-NJO era and that picture of Mara Jade’s funeral. Even if every story from the Bantam/New Republic Era were as diverse as Coruscant Nights, as time went on, ninety percent of those secondary characters would still have faded into the background, and you’d still be left with the cast of the NJO and beyond – essentially a collection of WHM primaries from the twenty years of material leading up to it. This is why disregarding the issue, as LucasBooks have largely done in the past, is still contributing to the problem. 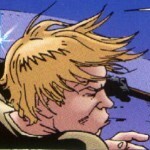 The NJO was a perfect opportunity to usher in a new generation of main characters, but too much of the work done to expand the cast ultimately proved fruitless–characters like Ganner Rhysode, Eryl Besa, Droma, Nom Anor, and Danni Quee die or fade away, while Corran Horn and Kyp Durron soldier on. Those of us who were around when Del Rey first took over will remember the NJO beginning with the stunning pronouncement that no one was safe, and to prove their point, they dropped a moon on the most prominent alien in the franchise. Now, more than a decade later, that policy has been far more true of their own creations than anyone else’s–and certainly not of the Big Three. In fact, that Chewbacca was indeed an ideal kill–beloved by fans, but completely unnecessary to the story–should speak volumes. When I first started documenting this issue, I came up with something called a Diversity Score. It’s derived from a given book’s Dramatis Personae when available, or educated guesses when not, and basically boils down to the percentage of non-WHMs in a story’s overall cast. While it’s an inherently messy measurement–and perhaps unfairly lumps many types of characters into one big group–with a great deal of input from the community on the temp boards, and a lot of math and page-flipping on everyone’s part, the system has been refined to the point that we were able to get a nice collection of data. Special thanks to @Kais_Jai_Sheelal, @The_Loyal_Imperial, @AdmiralNick22, @Havac, and @FiveThreeOhNine for a lot of help compiling this information. While hashing all this out, a few quirks had to be ironed out – first and most notably, all the multi-book series are scored as one giant cast, rather than averaging each book. This proved to be more favorable to the authors overall (as Luke Skywalker is only counted once instead of numerous times), while also better illustrating the aforementioned issue of primary characters sticking around while large groups of secondaries come and go. Second, it was decided that any character whose race isn’t clear from the material would count in the negative. This was a tough one, but in the end, I felt it was more in keeping with the “ignorance is bias” philosophy. Another essay entirely could be written on the lack of decent attention paid to droids as characters–even Artoo and Threepio–but in the meantime, I made the decision that out of all the books we scored, the only droid character that earned their DP inclusion, and therefore affected the score, was I-5YQ. Goran Beviin and Medrit Vasur, as the only definitively gay characters in the entire franchise, were counted as non-WHMs, on the basis that I would’ve added “straight” to the WHM classification if not for the fact that gays were almost nonexistent. Another executive decision I made was to count all the main alien characters in Darth Plagueis twice. Despite having an utterly enormous cast, the prequel films saddled the book with what I felt was unfair WHM baggage; by contrast, nearly every single character in the book that Luceno created himself was something else. This strategy took the book from a 53 to a 67, which I felt was a fair adjustment. Lastly, all clones were counted as different characters. Some may see this as unfairly boosting many of the Clone Wars books, but while no author can take credit for the fact that Temuera Morrison happens to be Maori, they do deserve credit for the extent to which they choose to utilize the clones as individuals. Note that the “best” books tend to be in the 70s or 80s–and the recent Scourge manages an impressive 91–while LotF scores a 58 and FotJ a 61. Even the NJO and its plethora of Yuuzhan Vong characters only manages a 69. The Dark Nest trilogy, which revolves around a blossoming war between the Killiks and the Chiss, and which features among its supporting cast a Sullustan-Ewok partnership and a trio of Squibs, still only scores a 65. With all these exceptions and caveats, what can we truly take away from these numbers? In the entire X-wing series, almost half the characters are straight, white human men. In the entire New Jedi Order series, one out of every three characters is a straight, white human man. In the post-NJO era, two out of every five characters is a straight, white human man. Historically, one thing that almost everyone has brought up when disagreeing with the thrust of this argument is that Star Wars is escapism–whether or not one sees it as neutral, is should be neutral. They read Star Wars books to get away from real-world concerns and controversies, and don’t want to see what they consider political advocacy in the franchise, no matter which side it’s on. For starters, a lack of diversity isn’t only a problem for “political” reasons – it’s a continuity problem. Aside from one highly dubious page on the old Wizards of the Coast RPG website (thanks to @Genghis12 for pointing it out), there is essentially nothing in the way of official information on the demographics of the GFFA. You would be hard-pressed to find someone who doesn’t believe that humans make up a plurality of the galactic population, and some might even say a majority, but if two out of every five beings in the galaxy were human men (of any race, for that matter), that would mean another two are human women, which leaves only twenty percent of the galactic population to be made up of all the other species in existence. Think about all the insect species we’ve seen, and all the species born in litters. Some, like the Verpine and the Selonians, are presented as having every bit the spacefaring history that humans have–yet after thousands of years of membership in galactic society, how many characters are Verpine or Selonians? One in a hundred? Two hundred? Five? Certainly in-universe explanations for this kind of thing can be formulated–indeed, they have to be–but the longer this pattern continues unnoticed and unimpeded, the more it strains suspension of disbelief. And that’s just the empirical argument; there are, of course, “political” reaons for greater diversity as well. It is my opinion that, just as the facilitation of ignorance contains inherent bias, the facilitation of multiculturality in storytelling has inherent value. From the Mos Eisley cantina on, the GFFA has always been constructed as a place where the bug people can come together with the humans and the dog people and the skeleton people to champion freedom and equality, and no one cares if you have hooves or three eyes (or, well, miscellaneous) as long as you’re into the whole peace and justice thing. The franchise can talk up that angle all it wants, but it does fundamental damage to your message of inclusivity when all your protagonists look like they’re from Elstree Studios. George Lucas had pragmatic reasons for that, but no novelist has anything of the sort. People also like to say that Star Wars should serve as an escape from real-world issues, forgetting that such an escape should be available to everybody, and that becomes much easier–especially for young children–when the people an the book cover remind you of yourself. Star Wars, more than perhaps any other pop culture phenomenon, has a tremendous history of shaping young people’s self-image, and the effect on a young black child who wants to dress up as a Jedi for Halloween and is given a mask of Hayden Christensen’s face is real, serious, and not to be underestimated. And while I’m on the subject–homosexuality is only an “issue” to people who aren’t homosexuals – for those who are, it’s not a topic they can choose to avoid (as Lucasfilm did for a very long time), it’s their very being. Talk to the authors. When asked about diversity, the editors will always say they’re in favor of it, but there’s a big leap from thinking diversity is swell to actively encouraging it. So the first step should be to pay attention to who’s actually writing at any given time. Consider an author’s previous work: have they done a good job? Are they writing aliens stereotypically, or at all? Are the female characters well-rounded, or tokens? Below this post I’ll be adding contact information for the current roster of novel authors, with more to follow in the future–reach out to them through e-mail or social media and let them know you’re a devoted Star Wars fan who’d love to see a couple small changes. Remember, constructive criticism will always be taken more seriously than ranting. Having said that, talk to the editors, too. Make yourself heard at cons and in online chats. Spend at least as much time praising good work as criticizing bad work, and make it clear that you’re there on behalf of the former. Are John Ostrander and/or Jan Duursema there? How about John Jackson Miller or Michael Reaves? Thank them. I said at the beginning that I first want to make people see this as a problem. If I’ve done my job, then you may find yourself looking for certain visual descriptors the next time a human character is introduced. That’s a good thing, because a huge part of what got us to this point is that no one really paid attention to whether novel characters were white or not (or straight or not, for that matter), and as time went on and they were drawn into this RPG book or that Essential Guide, no artist had any obvious reason to make them nonwhite, so they didn’t bother. That’s not wholly the artist’s fault any more than it is anybody else’s, but it’s hard to cut down on ambiguous characters if we’re not at least paying attention to them. In conclusion, I just want to add that I’ve been coordinating this diversity conversation in one form or another for a few years now, and if any of you remember the early days, you’ll know that I used to get a great deal more flack for harping on it then I do now (I didn’t title the first thread “Beating a Dead Eopie” for nothing). Maybe we just argued all the dissenters into early retirement, but I like to think that I’ve brought some of you over to my side along the way, and that the Literature community is a more open-minded, progressive place because of that.I also want to specifically acknowledge the efforts of my partner in crime, @JediSmurf, whom I’ve known online for longer than I care to admit, and who has done a lot of great legwork on this by showing up at SDCC year in and year out to keep asking the same questions, never losing hope that one day the answers will start improving. Oh, and she also cofounded a little thing called Racebending. NBD. Lastly, I don’t want this thread to become an echo chamber. If you do disagree with the above, in whole or in part, please–join the conversation. True diversity includes diversity of opinion, and an opinion that can’t withstand direct scrutiny isn’t an opinion worth having. With this as my introductory caveat, here is the concern I have here. By asserting there is no “neutral” – that you are either supporting diversity or implicitly involved in hindering, you end up losing the point of Star Wars. It’s meant to be entertaining – but while it does provide information about society and societal attitudes, to turn it into the locus of promoting a change in society is perhaps a bridge too far. I think it would be more fair to rather view how things are written more as a snap shot of where society is. I also think this is important because I don’t think anyone wants mere “token” diversity. Is it really positing diversity if there is just some drive to make sure that there are non-white males taking the lead? That’s… placating. What I think we would want would be a Star Wars Universe where there are characters with good stories… and that’s why we are watching them or reading them… because they are good stories (regardless of their demographic categorization), not because they fit some niche or goal. When the non-white male character just is what she is… not to prove a point, not to demonstrate some ideal… but because this person has a good story, and the fact that she is ________ is just part of her story, nothing more, nothing less. Now, I guess this then leads to the question of whether or not you need to have conscientious breaking of standards to bring this about — and I don’t think so. I’m a preacher – trust me, people *know* when they are being preached to. And they also know when they are simply getting a good story and learn to care about a character, even a character that is radically different than who they themselves are. Hi, Eric–first off, thanks for such a thoughtful and reasoned response. I guess the first point where I diverged from you is when you mentioned “promoting a change in society”. I do think SF is uniquely positioned to promote change insofar as it’s often aspirational–when Lando showed up in 1980, his friendship with Han wasn’t necessarily a snapshot of where society was at that moment, it was showing where things should be by demonstrating that people in the GFFA were beyond race as a factor in their interpersonal relationships. Same thing with Uhura in the original ST–it makes an implicit statement without directly addressing race in the story. And speaking of addressing race overtly, I think whenever someone complains about tokens, all they’re really complaining about is flat characters–and as you say, no one wants that. But I do think SW has a responsibility to present A) humans as having progressed beyond the contemporary definition of tolerance (because without a Lando, you might not get a Mace Windu) and B) a galactic-level civilization whose demography doesn’t strain suspension of disbelief. To the former, I think the best evidence of where George Lucas’ intentions lie on the matter is the Mos Eisley cantina—even with no budget and a million different production problems hanging over his head, he made a point of cramming dozens of ridiculous masks and puppets into a bar; he saw it as crucial to his setting to demonstrate that people in this galaxy were well past giving a crap about appearances. Again, that’s not an overt nudge to real society–but it is aspirational in its way. To the latter, I can only restate my point from the piece—even if I didn’t care about the philosophical implications of a 98% white human cast and an 80% human species cast, it would utterly destroy my ability to take the GFFA setting seriously, so when I advocate for the deliberate “breaking of standards” in favor of aliens, and women, and persons of color, it’s because I think it makes the setting stronger; that it might also inspire real social change, or at least give readers who aren’t straight white men someone they can look up to, is just gravy. Lastly, if you’d like to continue the conversation, consider this a personal invitation for you to join the original discussion thread at the TFN forums; it’s been around so long now that most of the regular users with divergent feelings on the subject just ignore it entirely. It would be a breath of fresh air to have a cordial back and forth again, instead of just an echo chamber. I actually think we then are pretty close. Perhaps I am more worried about Diversity being *overstated*, being the obvious point, rather than just an expression of reality. Lando is understated. The Cantina is… just the way it is. These are great. But while I love Stackpole and the X-Wing series… Gavin’s trial is… yeah. Gavin’s later relationship with Asyr, though, is fine.